"He's a freak of nature, the guy is ridiculous. 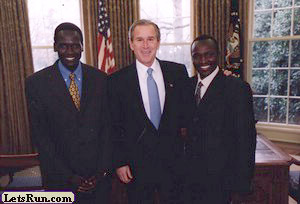 He's capable of challenging my American record in the 800, but in the 1,500, my goodness, he can break the world record [El Guerrouj's 3:26.00, in 1998] and win medals." - US 800-meter record holder Johnny Gray (1:42.60) talking about Andrew Wheating in a Sports Illustrated piece on the "giant" talent. Former D1 Runners w/Kids: My 7th Grader doesn't seem to "have it"
Who runs 7 days a week? 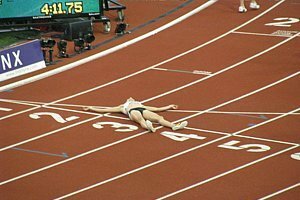 Who are some names of least known great distance runners? *SI Claims Logan Secured $10 Million A Year Deal With Nike If that's the case, they couldn't be too far off their $12 million goal for sponsorship for 2010. 15-Year-Old Japanese Runner Break 30-Year-Old Jr. High 2,000 Meter Record His time of 5:34 equates to about 4:20 in the mile. Nick Willis Runs 3:35.17 To Win As Alan Webb Runs 3:36.21 To Finish 5th! 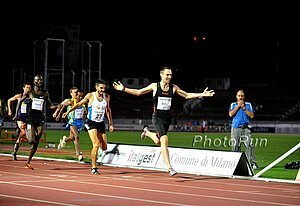 Fans of Alan Webb are starting to get excited as his comeback is officially on, as he ran just .35 slower than he did in 2008 when he flamed out in the Olympic year. Want A Rematch? You've Got It!!! Lagat, Manzano, Webb And Willis To Clash On September 26th At Continental Airlines Fifth Avenue Mile In a day and age when people say there aren't any rivalries or races worth watching, this one looks like a real dandy. 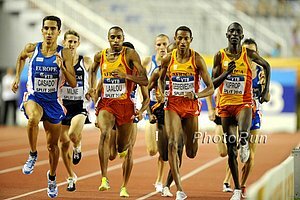 *IAAF Recap Unheralded 20-year-old Ethiopian Almirew Yenew (a 13:16 and 7:46 guy) of Ethiopia crushed the field in the 3k, running 7:28.82. Asbel Kiprop basically quit over the final laps for the second race in a row. Commonwealth Games Stadiums Are Built - Dengue Fever Fear Still Alive Officials are telling people that they only have a .0082% chance of getting the disease. Philly: Men: Ryan Hall Vs. Gebre Gebremariam Vs. Abderrahim Goumri Gebremariam, the 2009 World XC champ, has been tearing up the roads in 2010, winning everything in sight. Hall, however, has the best half PR of the group. 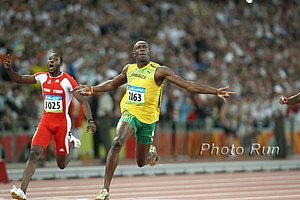 Usain Bolt Wants To Retire On Top Whether he thinks he'll be on top still in 2016 will likely determine how long he sprints. Radical Changes Proposed To Olympic Marathon Course That Would Result In The Runners Not Finishing In The Olympic Stadium The Olympic stadium finish is one of the hallmarks of the Olympics but the proposed new course features loops in the famous part of London with the Houses of Parliament, St Paul's Cathedral and Tower Bridge.